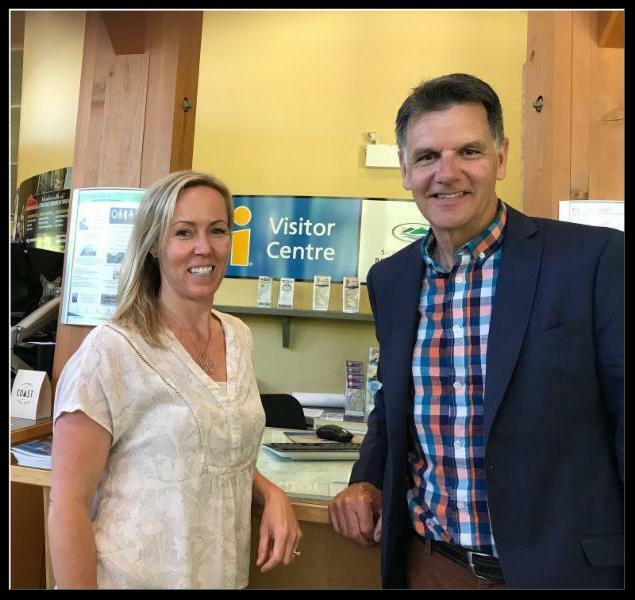 Summer Road Tripping 2018 - Walt Judas stopped in to visit some members in the Sea to Sky Corridor this summer, including Lesley Weeks, Tourism Squamish. 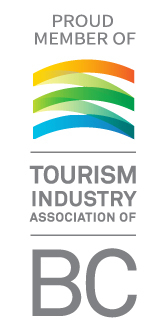 When TIABC’s board met earlier today, the consensus was that members remain disappointed and surprised that, in spite of significant input and opposition, government is moving forward with substantial changes to a long-standing revenue source that funds tourism marketing in 56 communities around BC. As you likely know by now, the Province has approved a regulation change that allows municipalities to use tax revenue (collected from visitors) specifically designed to fund tourism marketing, projects and programs for affordable housing…a move we believe could seriously erode or eliminate British Columbia’s competitive advantage. What’s more, we fear the new regulations will pit local governments against DMOs in a competition for dollars, as we’ve seen in jurisdictions locally and elsewhere. Yes, tourism workers need more affordable housing (as do workers from multiple other sectors), but redirecting MRDT funds is unlikely to make any significant difference in addressing the issue anywhere in BC. On the other hand, reduced marketing dollars will have an affect on tourism. For decades, MRDT revenues (& its previous iterations) earned by DMOs in partnership with industry and government have not only provided communities with the resources needed to attract visitors, boost local economies and create jobs, they’ve also led to record-setting results. Allowing these funds to be used for housing compromises both short and long-term marketing investments, which are fundamental to maintaining and growing British Columbia’s visitor economy. As a tourism business owner and in my capacity as TIABC president, I am concerned about a series of decisions in the past year that have directly affected BC’s visitor economy and thousands of small businesses like mine. Yet I remain hopeful that government will ultimately recognize tourism as one of the province's most important business sectors and understand the ramifications of changes to regulations like MRDT. One thing I'm certain we all agree on is...it's far better for us to work collectively on building BC’s visitor economy, rather than trying to protect it from going down. On March 13, the government proclaimed April as British Columbia’s official province-wide wine month encouraging British Columbians to discover, share and choose 100 per cent BC wines. 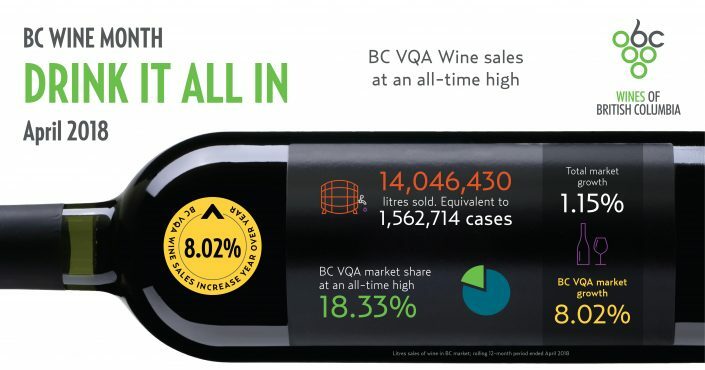 The BC Wine Institute reports BC VQA Wine sales were up eight per cent over this time last year, reaching an all-time high of 18.3 per cent in total provincial market share for the rolling twelve-month period ended April. The people's choice on BC Wine is about to begin! The Best of BC Wine Country Awards are back. The Wines of British Columbia is set to open voting to the public on their favourite BC wine country experiences from “Best of” categories related to BC wine and food tourism. Please email Info@WineBC.com for more details on how to get involved: voting buttons for your website, posters, rack cards, etc. 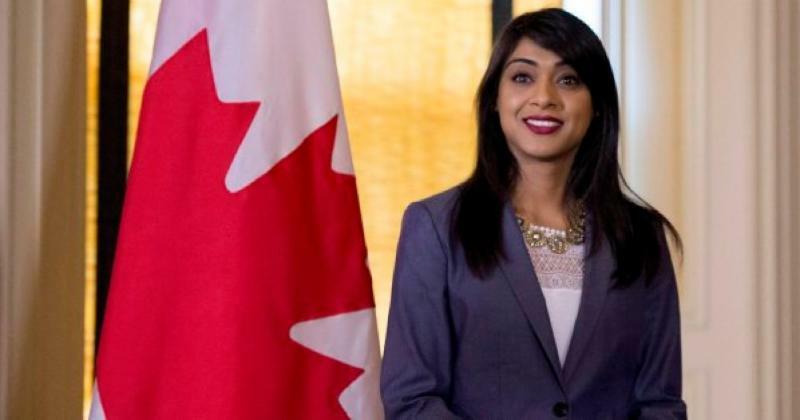 In a recent Canadian government cabinet shuffle, Minister Bardish Chagger remains the Leader of the Government in the House of Commons, but is no longer the Minister of Tourism. TIABC wishes to thank Minister Chagger for her enthusiastic support for our important industry. 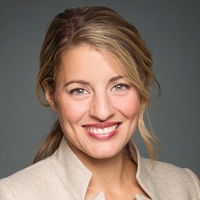 Mélanie Joly becomes Minister of Tourism, Official Languages, and La Francophonie. She had been Minister of Canadian Heritage. TIABC welcomes Minister Joly to her new role and we look forward to a productive working relationship. 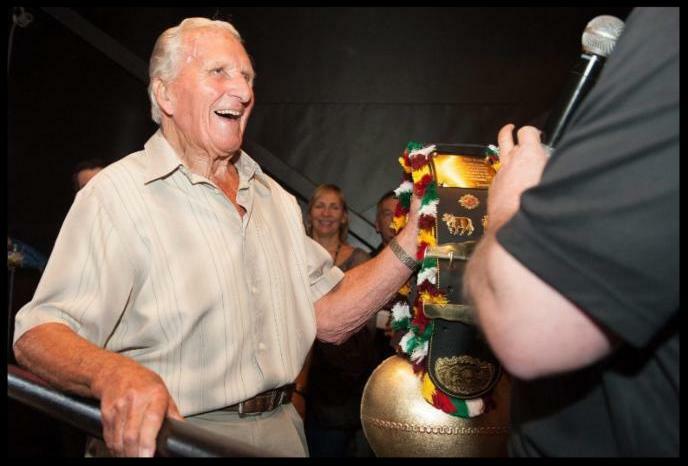 Canada West recently shared news of Jimmie Spencer’s passing in the early afternoon of July 16 in Vernon with wife Andy and sons Iain and David at his side. 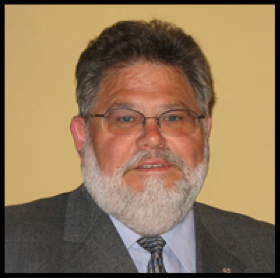 CWSAA and TIABC express their heartfelt condolences to Andy and the entire Spencer family. As the CWSAA stated in their notice: "Much will be said of Jimmie in the coming days. The accolades and successes are voluminous. Likely his greatest legacy, however, will be the generation of leadership and cooperative culture he expected and created between competitors to establish The Canada West Way . It is a way to compete, at times ferociously, but also develop inclusiveness and respect between ski areas, and collective best practices to elevate the entire industry. In so doing, he inspired and motivated a generation of leaders, that are now themselves being tasked to groom, train, and mentor their next generation. A legacy of excellence. Thank you Jimmie. The expression, ‘we follow in the footsteps of giants,’ has never been so true." 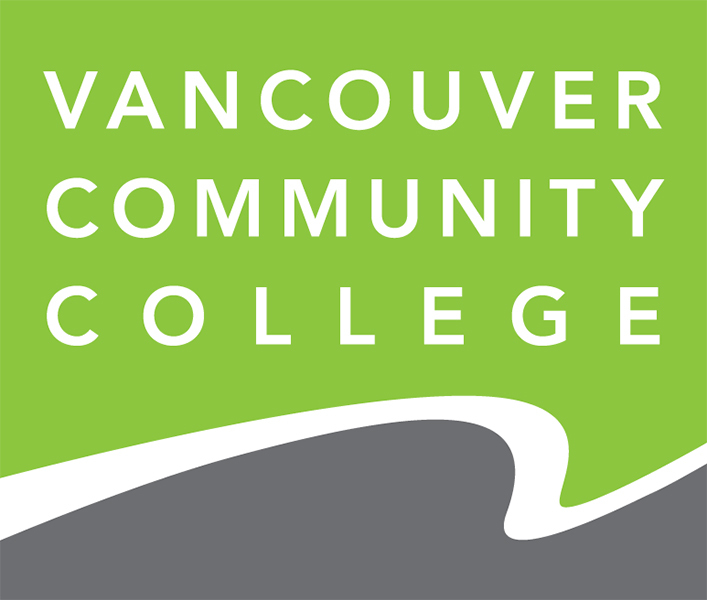 Intake for the September semester for the Bachelor of Hospitality Management program at VCC is underway. This program prepares students for advancement into graduate programs, as well as advanced corporate training programs in business, hospitality, sport management, finance, law and public administration, among others. 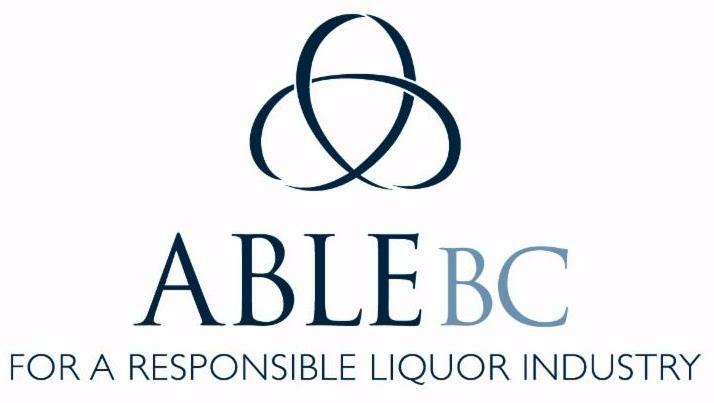 ABLE BC is hitting the road this summer to host liquor industry meetings across the province. The next leg of their tour is through Northern British Columbia. BC's Alliance of Beverage Licensees (ABLE BC) is the leading voice of British Columbia's private liquor and cannabis industries. Their membership includes: private liquor stores, pubs, bars, nightclubs, hotel liquor licenses, and various agents, industry suppliers, and benefit providers. On behalf of their over 1,000 members they advocate for a thriving and sustainable private liquor industry. Registration is now open for the Kootenay Rockies Tourism Industry Conference and 41st Annual General Meeting. The event will be held on October 15 & 16 in Cranbrook. Earlybird registration is available until August 17th. Registration is now open for the 55th Tourism Vancouver Island Conference & AGM. The event will be held September 25 - 27 in Port Hardy. Earlybird registration is available until August 31st. Just as predicted, the Easter effect had an impact on arrivals in April, as travellers from many of Canada's key international markets chose to explore Canada in March (over Easter) instead of April (when Easter fell in 2017). 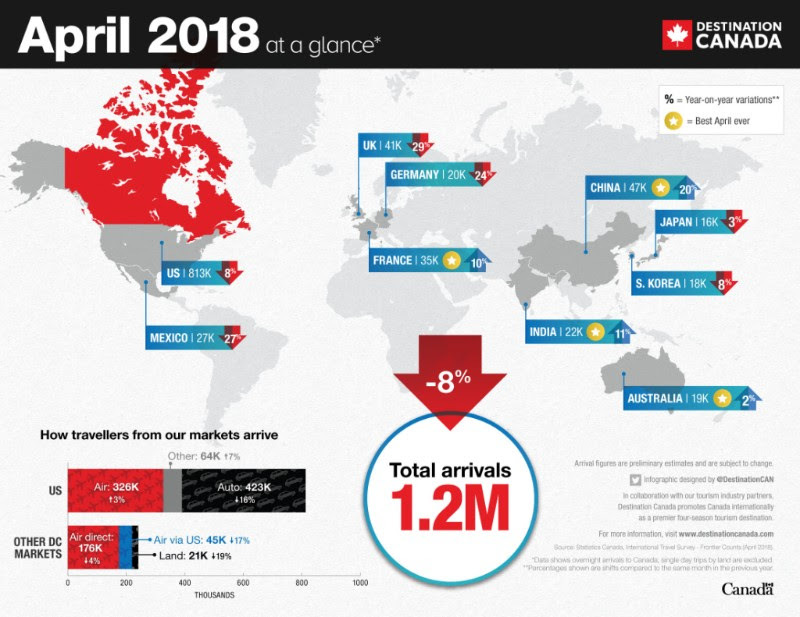 When comparing April 2018 to April 2016 (the last time Easter was in March) there is a 6% increase in arrivals. Notably, arrivals from China continues to outpace the UK to be our largest long-haul market, up 23% year-to-date, and US air arrivals continue to see steady growth, up 3% in April and almost 10% year-to-date. Total tourism spending is up 1.4% over the same time period in 2017, to $21.8 billion. Increased spending by international visitors in Canada was partially offset by lower tourism spending by Canadians at home. Tourism spending by Canadians in Canada edged down 0.1% in the first quarter, compared to an increase of 0.7% for Q1 2017. This was the first time since the first quarter of 2009 that domestic tourism spending has declined in two consecutive quarters. Tourism spending by international visitors to Canada increased 1.5% in the first quarter, compared to 1.6% in Q1 2017. Tourism gross domestic product (GDP) increased 0.3%, compared to a rise of 0.8% rise in Q1 2017. Kristy Jahn-Smith has been chosen to lead Cranbrook Tourism, starting August 1st. 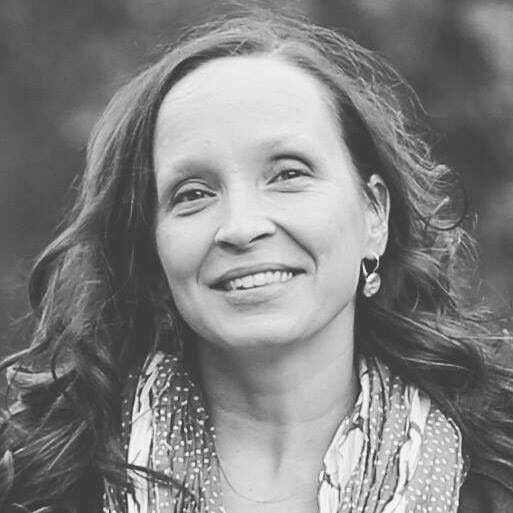 Jahn-Smith, who has also lived in California, Japan and South Africa, developed her marketing career in Western Canada, most recently as marketing manager for Silver Star Mountain Resort. 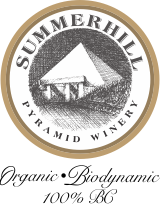 Summerhill Pyramid Winery features organic and biodynamic wine grown in the beautiful Okanagan Valley . ﻿Organic winemaking practices have been an integral part of Summerhill Pyramid Winery since the Kelowna vineyard was purchased by the Cipes family in 1986. C larification in a True Pyramid is the final step in their unique wine production. We can't do this without your support, as we are a member-driven, and funded organization. Whether your business, association or DMO is large or small, join us today and make the voice for the tourism industry even stronger. And mark your calendars for TIABC's AGM (November 1 in Vancouver) and our BC Tourism Industry Conference February 27 - March 1, 2019 in Vancouver. 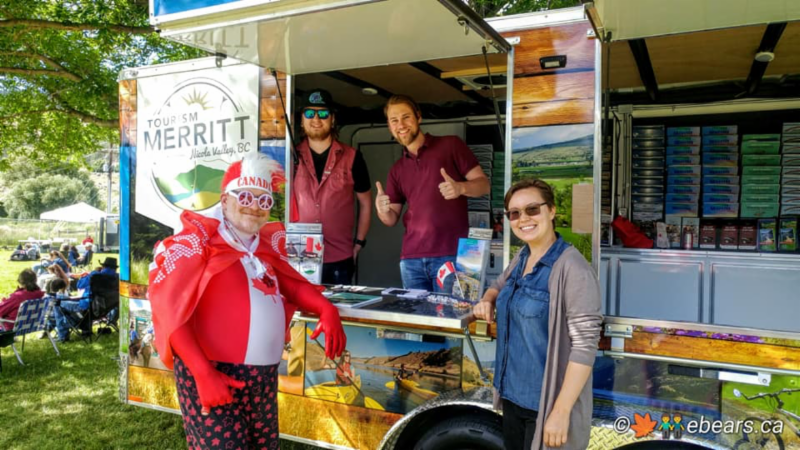 Tourism Merritt recently presented their new Mobile Information Kiosk and the return of our Summer Tourism Ambassador Program. The kiosk will be parked on site for special events like the Rockin' River Fest and the Motion Notion Music Festival. 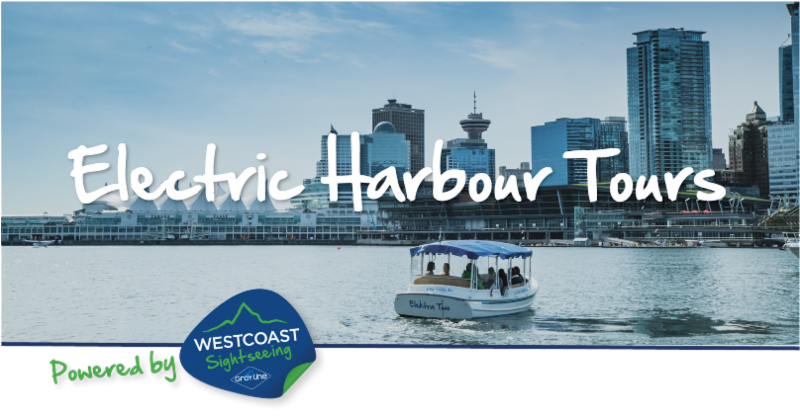 Westcoast Sightseeing is thrilled to add a new harbour tour this summer aboard electrically powered, 10-passenger boats from Heritage Harbour at the Maritime Museum dock at Kits Point. This expands Vancouver’s first zero-emission boat tour offering. 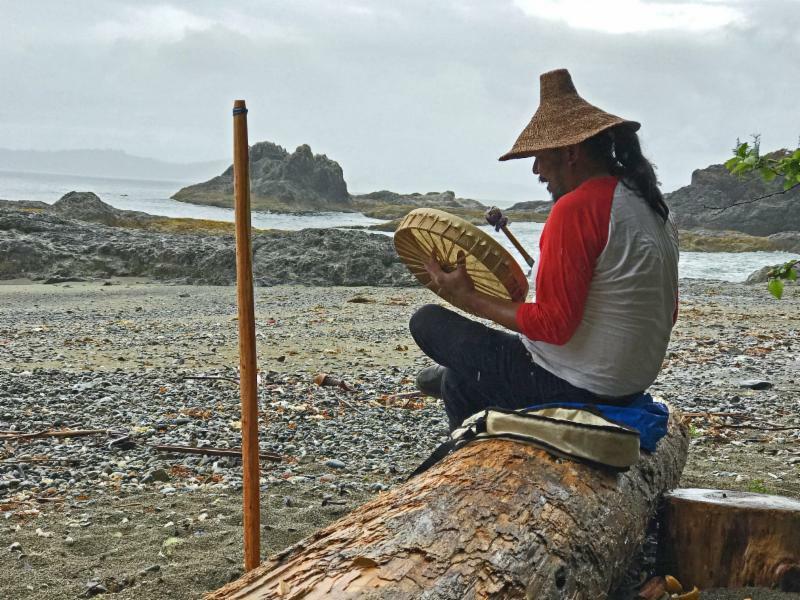 T he Huu-ay-aht nation bought 11 properties in Bamfield in 2016 including lodges, a motel and pub, a restaurant and even an airstrip. Getting the tourism businesses up and running is part of a larger economic plan. 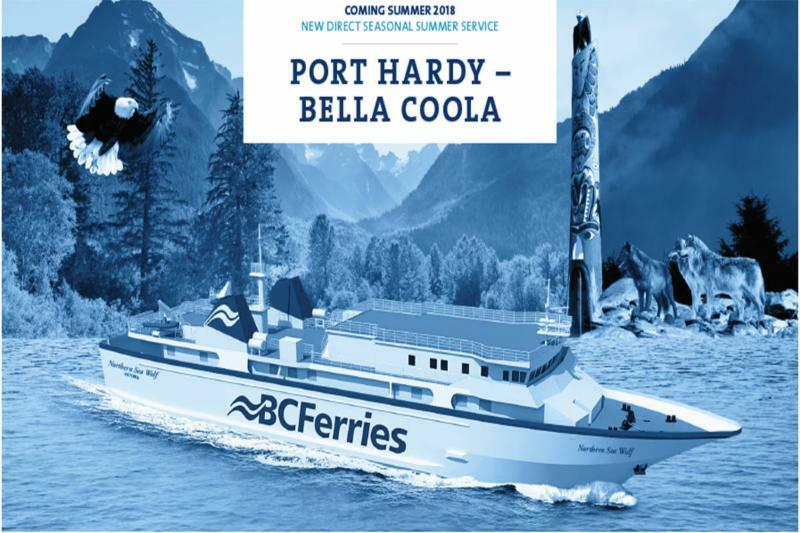 A direct ferry service between Port Hardy and Bella Coola has been delayed for another couple of months, meaning it won't be in place for the summer tourism season. A lot of businesses in Bella Coola have been gearing up for the summer season, expanding lodging space and promoting the region — especially after last season's wildfires, which hit the area hard.